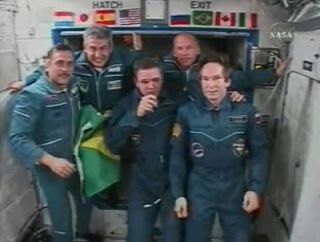 Brazilian astronaut Marcos Pontes (top left) waves a Brazilian flag after he arrived at the ISS with Expedition 13 commander Pavel Vinogradov (lower left) and flight engineer Jeffrey Williams (top right). Expedition 12 commander Bill McArthur (center) and flight engineer Valery Tokarev welcomed the astronauts aboard on April 1, 2006. This story was updated at 11:18 a.m. EST. A pair of unexpected alarms cutshort an airlock camp out for two NASA astronauts aboard the InternationalSpace Station (ISS), the U.S. space agency said Tuesday. Expedition12 commander Bill McArthur and Expedition13 flight engineer Jeffrey Williams had sealed themselves inside the spacestation's Questairlock after dinner and lowered the atmospheric pressure to purge nitrogenfrom their bloodstream while they slept. But the activity, designed to test atime-saving procedure for future spacewalks, was terminated after the second oftwo alarms apparently caused by a software glitch, NASA officials said. "The teams are now looking at all the data todetermine what may have caused the inadvertent alarms that woke up the crew,"said NASA spokesperson Kyle Herring during a daily ISS commentary. Two alarms,the second of which prompted mission controllers to scrub the camp out, apparentlywere caused by a data spike that was erroneously reporting a low carbon dioxidelevel, Herring said. "We enjoyedour little adventure last night," McArthur told NASA ISS flight controllersearlier today. "It's a good chance to get into some of the guts of the airlock." McArthursaid he hoped to learn whether all of the test objectives were accomplishedduring the curtailed camp out. NASA spokesperson Kylie Clem at the agency's Johnson Space Center (JSC) in Houston told SPACE.com that the camp out was terminated at 12:43 a.m. EST (0443 GMT). Flight controllers will go through the data collected from the camp out test to determine whether or not another test will be required, she added. On Monday, McArthursaid the camp out would allow flight controllers to test a new way to flush nitrogenfrom the body before future spacewalks. "It's very important that we try to eliminatethe nitrogen in our bloodstream before an EVA (extravehicular activity) tominimize the chance of getting a condition called the bends," McArthur saidduring a Monday press conference. Also known as decompressionsickness, the bends can occur during a sudden drop of surrounding pressure - onEarth it can afflict deep-sea divers who ascend too quickly - which allowsnitrogen bubbles to form in the bloodstream and cause pain in the joints andchest, cramps or paralysis if unchecked. While divers surface gradually froma deep expedition to prevent the bends, astronauts spend hours breathing pureoxygen to flush nitrogen from their bodies prior to spacewalks. During Monday's test, McArthur andWilliams hauled their sleeping bags and other personal items into theelevator-sized Quest airlock, sealed the hatch behind them, and then loweredthe pressure inside from the station's standard 14.7 pounds per square inch (psi) - or about the same as at sea level on Earth - to 10.2psi, NASA officials said. "I'd compare this protocol to howscuba divers avoid the bends," said Roger Lottridge,a spacewalk systems flight engineer for United Space Alliance at JSC where mission controllers watched over the camp out. "Staying in the airlock overnight at the reduced pressure is sort of like thatslow rise." Plans for the camp out procedurehave been in place since the Questairlock arrived at the ISS in 2001, Lottridgesaid, adding that the procedure is expected to be used during NASA's STS-115shuttle flight in August. Also known as 12A, the STS-115 spaceflight featuresthe delivery and installation of a new solar array outside the ISS byspacewalking astronauts. "It probably gets us out the doorabout 30 minutes to an hour earlier, which for certain flights can be verybeneficial," Lottridge said of the Quest airlock campout. "Especially, for instance, on the 12A flight.By getting out there a little earlier, it doesn't make...the EVA crewmembers, thelong pole in the process if getting that solar array activated on the firstEVA." There are some drawbacks. Unlike onpast shuttle flights, where the restroom and kitchen are at hand during theentire crew cabin's pressure drop to 10.2 psi beforea spacewalk, the Quest airlock carries no lavatory or galley. "The airlock is like a big rigsleeper," Lottridge said. "You don't have thoseamenities." The comfort level of the crew andthe performance of sensors and hardware designed to watch airlock pressure,carbon dioxide levels and maintain its atmosphere were to be watched closelyduring the test, Lottridge said. "Hopefully we'll have gathered allthe data that the folks on the ground need to validate that function of theairlock," McArthur said. McArthur and Williams are in themidst of a stationcrew change. McArthur and Expedition 12 flightengineer Valery Tokarev are handing control of the ISS over to Williams andExpedition 13 commander Pavel Vinogradov,who arrived at the station earlySaturday with MarcosPontes, Brazil's first astronaut. Pontes will return to Earth on April 8with the Expedition 12 astronauts, who have lived aboard the space stationsince October2005. "We're ready to go home," Tokarevsaid. "We have accomplished all our tasks, we are happy."